Informality can be interpreted as a positive quality hinting at individual freedom or even be romanticized as bottom up and empowering force. But informality as safety valve for a system that is not able to adjust to changing conditions smoothly and quickly enough is another matter. The mass migration of people to cities cannot be met by regular housing schemes, so people have to provide their own. The sea of unemployed provides a labor reserve that comes in handy when the economy is growing and that can easily be ditched once the economy slows down again. In global capitalist market economy, informality is not an errant, a flaw in the system that’ll soon be taken care of; it is part of the system’s ‘design’. 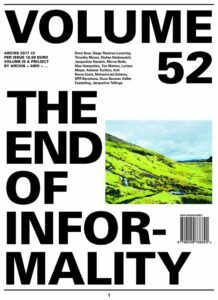 Volume is an independent magazine that sets the agenda for architecture and design. Subscribe now!